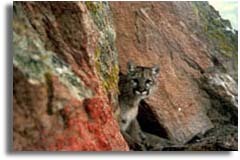 The following information is not intended to scare anyone about mountain lions but merely provide information regarding the rare but fatal attacks by wild cougars. If you know of a cougar attack we don't have listed please e-mail us the information. California - June 1890 7 year old boy killed by two lions while playing near his home in Siskiyou County. California - July 1909 Rabid cougar attacks woman and child who survived the attack but died later from rabies. Washington - December 1924 13 year old boy attacked and killed by a 3 year old healthy male cougar. British Columbia - January 1971 12 year old boy attacked and killed by male cougar while playing with his sisters. British Columbia - July 1976 7 year old girl killed by 2 year old male lion on Vancouver Island. British Columbia - May 1988 9 year old boy stalked and killed by 4 year old male mountain Lion. Montana - September 1989 a 5 year old boy was attacked and killed by at least two possibly three cougars. Colorado - January 1991 18 year old Scott Lancaster boy killed while jogging on his high school track in Idaho Springs. California - March 1991 3 year old attacked and killed by cougar. British Columbia - May 1992, 7 year old boy attacked and killed while playing in the school yard. The young female cougar was killed at the scene. California - April 1994, 40 year old, female long distance runner was attacked and killed while jogging in the Auburn State Recreation area. California - December 1994 56 year old woman was killed while hiking alone in Cuyamaca Rancho State Park. British Columbia - August 1996, Mother killed while defending her 6 year old son on horse back riding trip. Colorado - July 1997, 10 year old Mark Miedema, of Lakewood was killed by an adult female cougar while hiking in Rocky Mountain National Park when he got ahead of his family. Colorado - October 1999, 3 year old missing boys remains found and evidence suggests killed by Mountain Lion. Alberta - January 2001 30 year old female skier killed by mountain in Banff National Park. Arkansas - May 2003 41 year old woman was killed in her yard by what was most likely a cougar. California - January 2004, 35 year old Mark Jeffrey Reynolds, 35 was attacked, killed and partially consumed while mountain biking. The sources for this information include the California Department of Fish and Game, Paul Beier's Cougar attacks, and various news articles and books that are, in some cases, linked to above.